Scott Lang suits up to shrink into battle as the size-shifting hero, Ant-Man! 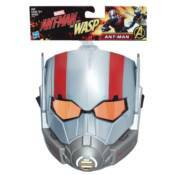 Kids can imagine suiting up like Ant-Man with this Ant-Man mask, inspired by the Ant-Man and the Wasp movie. Mask includes a flexible band to fit most ordinary mortals, so kids can pretend to be superhuman! Super-powers and shrinking powers not included.